See this image in higher resolution. London contains statues of almost every English or British monarch since Henry VIII. Imagine if they all got together for a right royal knees-up. 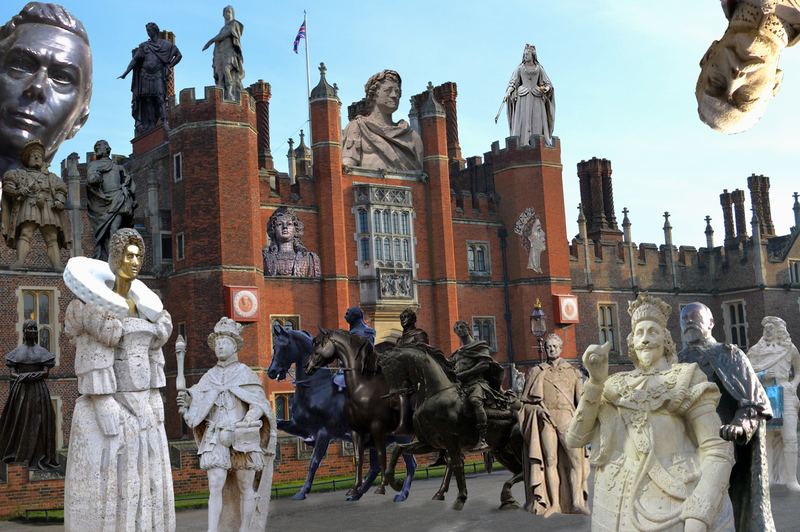 Beginning with Henry, we've depicted 20 kings and queens outside Hampton Court Palace. How many of the monarchs can you identify? Where in London would you normally find these statues (plus one mosaic)? Which monarchs have additional London statues (not shown here), and which rulers have no London statue, and are therefore missing from our ultimate Royal Flush? For bonus points, you can show off your knowledge of memorials to the kings and queens before Henry VIII, or locate some of the sculptures devoted to royal consorts. Answers are given below (you'll have to scroll down: no accidental cheating). Most images by M@, with additional photographs from London Remembers. Henry VIII: Far left, centre. Normally found at St Bart's Hospital gateway. Edward VI: Alabaster boy-king, holding the torch front-left. Normally found at St Thomas's Hospital. Lady Jane Grey: No known statue in London. Mary I: No statues in London that we know of. Elizabeth I: Tall, gold-headed maiden to the bottom-left. This one's from Westminster School, but there are many other statues around London. James I: He's the charcoal-grey chap, just above Elizabeth's head. This likeness can be found on Temple Bar, along with his wife Anne of Denmark, plus Charles I and Charles II. Charles I: The luckless king can also be seen on horseback at Charing Cross, a position that traditionally marks the centre of London. However, we've chosen to use his far more unusual statue from Guildhall, seen at the front-right with the large crown and darts-player's pose. Charles II: On the extreme far, right, clutching a blue handbag (it was there when we took the photo). He lives in Soho Square. James II: Charles's unloved brother has a paradoxically heroic memorial, ludicrously dressed as a Roman Emperor. He's the left-most of the two downward pointing figures in the top-left of our picture. In reality, he's moved around a bit (including time in Aldwych station and on the site of the Admiralty bunker), but he's now settled outside the National Gallery. William III: The prince from Orange is the nearest equestrian rider to us in the montage. He can be identified by the molehill beneath his horse, said to have tripped the beast, leading to the injured king's eventual demise. You can find the rider in the centre of St James's Square. Mary II: William's co-ruler is not prominently remembered in statuary. However, a small likeness of the queen can be found on the Hotel Russell, Bedford Square, alongside Anne, Victoria and Elizabeth I. She's depicted here in bust form, to the mid-left of the picture. Anne: The first monarch to preside over Great Britain has many memorials. We've chosen the one from outside St Paul's, which can be seen standing alone on a turret to the mid-right. George I: The Hanoverian can be found lurking on top of the steeple of St George Bloomsbury, with a lightening rod protruding from his august pate. We have him up with James II, pointing down towards Henry VIII. George II: Normally found in Golden Square, the weathered statue of this George is actually made from lead. We've slapped his laurelled bust-form on top of the entrance gateway. George III: The famously 'mad' king can be found on horseback in Cockspur Street, Trafalgar Square. See him above as the most distant of the three riders. George IV: The most dickish of the Georges is our final rider, sandwiched between his dad and William III. Normally, you'll find him up on one of the plinths in Trafalgar Square. Another memorial to this monarch was the origin of the name King's Cross, but it was long ago dismantled. William IV: The largely forgotten monarch, preceded and succeeded by much more famous family members, cuts a dashing figure in our montage in his billowing state robes, behind the last horse. His statue was originally sited on King William Street, but was moved to Greenwich Park to help traffic flow. Victoria: There are approximately 16 trillion statues to the super-famous monarch. We've opted for one of the lesser known ones, showing the Queen as a young woman, and normally positioned in Victoria Square. You'll find her above skulking behind the Queen Elizabeth statue. Edward VII: The Uncle of Europe can be found, perhaps surprisingly, loitering outside Tooting Broadway station (and also has an equestrian statue in Waterloo Place). He's depicted here with his arm around Charles I.
George V: The spritely monarch mischievously pokes his head into our montage from the top-right. He guards Westminster Abbey. We once overheard some American tourists getting all confused over his kingly dates: "1910-1936... but he looks much older". Edward VIII: The uncrowned abdicatee has no known statue in London. George VI: The Queen's pop has a rather charming memorial on The Mall, now accompanied by the likeness of the Queen Mother. He's shown in our image looming over Hampton Court at the top-left. Elizabeth II: There's no public sculpture to the reigning monarch in London, though that will surely change when she eventually joins her boss up in heaven. Some have suggested that she will grace the Fourth Plinth in Trafalgar Square. For now, the best we can get is a mosaic of her Regina-ness, under the escalators in the hideous One New Change building (William and Mary are also depicted here).